- Drill attachment wheel cleaning system. - Clean and polish wheels and rims. - Cleans tight, hard to reach places. - Labor saving cleaning tool. - Ideal for use with your favorite wax, polish, wheel product or compound.. The Polishing Ball Wheel & Rim Polisher System is a drill attachment polishing and cleaning system for wheels and rims. 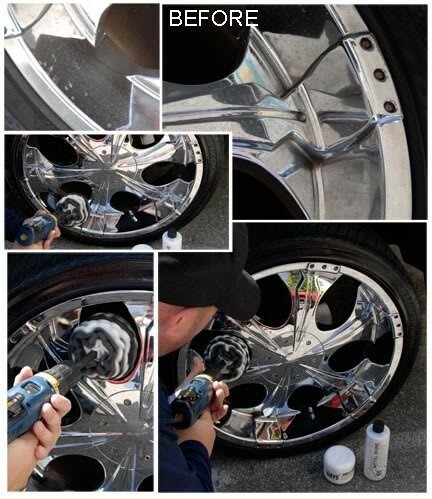 The Polishing Ball System works on chrome, diamond plate, polished, aluminum, stainless steel, alloy wheels and more. 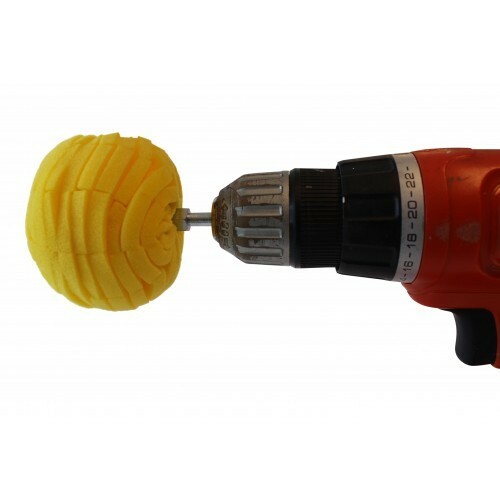 The Polishing Ball is made of heavy duty professional construction that allows it to bend and compress which allows it to fit into tight spaces. By fitting into tight spaces it can reach areas you've never been able to clean and polish before. The Polishing Ball System saves hours of hard work and makes reaching hard, cramped and tight spaces accessible. The Polishing Ball is made of durable space-age durafoam and fiber soft materials so it will never scratch your wheels and rims.